Festival-feel Flagship Event for 200+ participants that will bring together your whole community to celebrate the local area. More than a run, this event guide outlines and provides everything you need to establish a successful and profitable annual town event that get’s everyone involved. Local people, businesses and performers can all play a part! 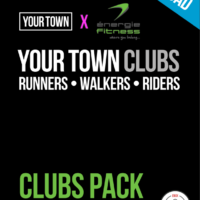 Give Your Town The Run Around is our flagship event that kicked off the Your Town journey. Intended to have 200+ participants, you could equally use this pack to put on a Ride Around or Walk Around if you wanted. In our first year we had 321 runners, in 2017 we were up to around 800. This event will bring together your whole local community in a festival-feel celebration of the local area, centred around a run, walk or ride. Essentially, we give you EVERYTHING you need to put on a successful event. In order to put on an event that celebrates a local community, it has to be run BY locals FOR locals, but that doesn’t mean it has to be hard! Let us help you to make your big day happen. The upfront cost covers the pack and a one-year branding licence from the date of purchase. Each year, you will only need to pay £99 for an updated branding licence, complete with up-to-date templates. The pack does not include event materials like medals etc., so we strongly advise that you check out our packs of events materials for a clear idea of the costs that will be involved in putting on each event.